Battlefield 3's executive producer says that the game has been designed to ensure that no civilians will die in combat. Patrick Bach, executive producer behind the third instalment of DICE's Battlefield series, is worried about how gamers react to being given the opportunity to kill civilians. He fears that, given the chance, we'll usually choose to be "bad"; to deal with this, he says, his team has chosen to remove civilians from the equation altogether. "Me personally, I'm trying to stay away from civilians in games like BF because I think people will do bad," he said in an interview with RockPaperShotgun. "I don't want to see videos on the internet where people shoot civilians. That's something I will sanitize by removing that feature from the game." Elaborating on his choice, he added that it "doesn't mean that I don't want people to feel that war is not good... We are trying to do something that is more mature. Mature not being gore - some people confuse the two. That's childish actually, to want more blood." He feels that although we still have a long way to go, games "will grow with gamers." DICE's choice is an interesting one, and adds to the growing number of questions about the place of real-world morality in games that simulate war. 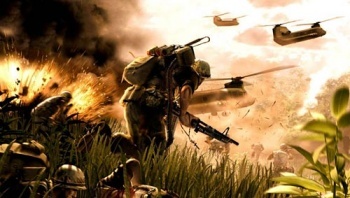 The community is still cautious about too much realism, as evidenced by the furor over Konami's Six Days in Fallujah and the suggestion that Modern Warfare 2's notorious "No Russian" level could have been used to train terrorists. But as horrible as it is, we live in a world where up to 90% of war deaths are civilian and where NATO felt that the levels of civilian casualty in Afghanistan warranted a complete overhaul of its rules of engagement. Hopefully, in time, our medium will find itself able to reconcile the reality of the world around us with the infinite moral choices offered by interactivity. In the meantime, DICE's decision is something definitive and progressive, and makes an interesting contribution to the debate over the place of real-world morality in war games.